The way of seeing art always reaches a point where we see the space first, and images from art viewers’ memories always come to the white ideal space of the gallery. Galleries or museums frequently become the medium to manifest and articulate artistic ideas. The Gallery as a Gesture statues that, “The gallery’s implicit content can be forced to declare itself through gestures that use it whole. That content leads in two directions: it comments on the “art” within to which it is contextual, it comments on the wider context- city, money, business-that contains it.” (Doherty, 1999, 87) The content can be one of the key coordinates in art institutions, which can be classified into different types of galleries and museums. Seth Siegelaub comments that, “art institution without social authority and its subservience to power could be very interesting, imaginative, and even spontaneous, but to degree to which it achieves this authority, it loses these possibilities (quoted by Siegelaub, 2008, 121).” Thus art institution should understand contradictions of changing new structure to formulate creative contents, but lose larger interests. 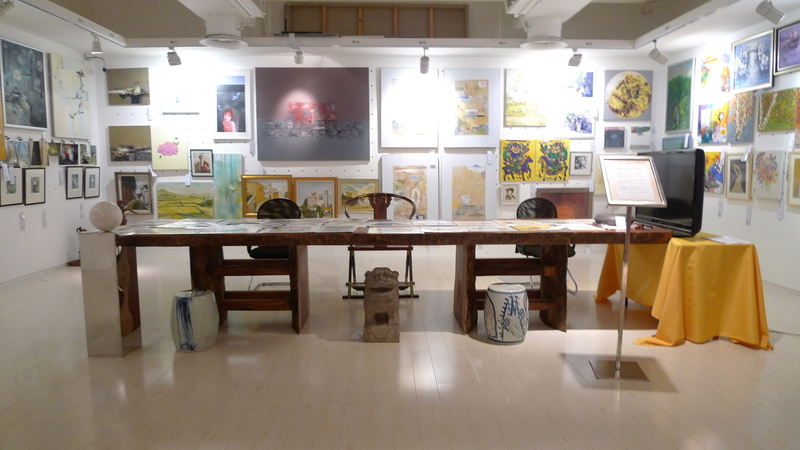 The term corporate-funded gallery has been in China for ten years since the Upriver Art Gallery was established by Chengdu House Property Company in 1991(http://www.artnow.com.cn). These types of galleries have increased due to the boom of economics and the popularity of Chinese contemporary art. On the one side, corporate-funded galleries have rapidly evolved during recent years. On the other side, they face problems: lack of funding- more specially state funding and government mechanisms of strict control, which make a complex and unscalable structure in some way. Zendai Museum of Modern Art Shanghai can be a typical example, which was established in 2005 and sponsored by Zendai Group, a privately owned enterprise. It is one of the significant contemporary museums in China and was officially renamed as “Shanghai Himalayas Art Museum” in September 2009. Tracing back the history, there were more than two years’ experimental exhibitions and it also collected some international art works like the public sculpture Love by Robert Indiana at the beginning. Then it tended to change its structures and had a series of programs named Intrude: Art and Life 366, starting from 1st January to 31st December2008. The project was designed to explore an alternative outside traditional art institutions, which aimed to a public sphere beyond the legislative control of art experts (Fraser, 2005, 278). In doing so, the entire project was divided into art events each day of the year, and it introduced contemporary art to the public through various art discourses such as urban sculptures, performances, symposia and concerts. But the curatorial idea was too ideal to be achieved because of the insufficient funding and weak organization. Intrude: Art and Life 366 was a pilot for progressive contemporary art institutions and turned out to be a regressive uncompleted presentation (Sheikh, 2004, 1). However, the failure of the project directly related to the curators’ obligations, which they failed to mediate between artists’ representation and the public participation. They also failed to complete the programme and there was a lack of good marketing skill (http://www.intrude366.com/zh-CN/about/). Fernand Braudel put forward the relationship between use value and exchange value, and he cited that, “nothing passes through the narrow gate into the marketplace by itself. The transformation from use value to exchange value involves a deliberate action and ‘a someone” (Andreasen, 2004, 24). Braudel’s point of view was applied into ZASS, which took the advantage of the interests through exchanging values. For instance, it would get 50% return from an art work’s selling price. ZASS was an intermediary agent and took over the relations between art producers and consumers to some extent. Staring as an exhibition-based institution, becoming an experimental project Intrude: Art and Life 366 and more recently ZASS, the Shanghai Himalayas Art Museum is facing a problem with keeping a sustainable model of institution. That also reveals the common problems of Chinese corporate-funded galleries, and the problems mainly turn out to be funding resources and the form of institutional administration. Though these problems also appear in Western galleries funded by private foundations and donations, Chinese corporate-funded galleries have more difficulties because there are no complete tax laws that can attract private donations to support contemporary art in China. Nowadays it is still hard to respond to these questions: who pay for the gallery constantly and which institution can support the long-term programming? Because China does not have a philanthropic tradition to fund public art, especially in the recent global recession. Due to this disadvantage, curators need to negotiate with a company or a business people to establish such an institution, engaging with a boundary of commercial interests and artistic objects. Aesthetic criteria are always subordinated to market and curatorial programming always supports commercial interests, which make corporate-funded galleries in a dilemma, neither belonging to experimental art spaces or well- organized commercial galleries. Some critics suggest that cooperate-funded gallery should be non-profit to gather more social support and public funding resources. But what is the definition of a non profit gallery in China and how can they survive in a non profit system? An answer came from Curator Wu Hung, based in the USA states that, “These are galleries defined by their owners as “non-profit,” meaning that they support these galleries and their operations with their own money, and that the art works exhibited there are not for sale (Wu, 2001, 169).” Supported by the owner, the main programs of these galleries are to organize temporary shows by gallery curators or guest curators. Due to the structure of galleries, short-term programming and “rental” exhibitions are the main source of gallery’s incomes (the gallery sometimes collect a high fee for renting its exhibition space and facilities). It is not surprising to find that galleries in this position are losing its credibility rapidly and hardly share interests with other semi-official museums or commercial galleries. It is not clear how many corporate-funded galleries exist in China, and they are searching for a new system that can allow the Chinese art market to develop. A Chinese established-curator Huang zhuan once suggested, “Today Chinese contemporary art is without authorities. How do we establish authority? We need to establish authoritative organizations via media…that every type of exhibition and art work can exist in this authority (Wu, 2001, 147).”A flexible authority needs to be associated with legal support, art institution, curators, artists and audiences. These aspects need to be closely related, exchange resources and formulate a new system. This ideal system could be a starting point for an entry into the alternatives of corporate-funded galleries today. Doherty, B. (1999), “The Gallery as A Gesture” in Insides the White Cube: The ideology of the Gallery Space. England: University of California Press. pp73. Obrist, HO. (2008), “Interview with Seth Siegelaub” in A Brief History of Curating.Dijon: Ringier&Les Presss.pp126. Sheikh, S. (2004), Public Spheres and the Functions of Progressive Art Institutions. posted on a.aaaarg.org. about Mediation” in Curating Subjects. London: Open Editions. Pp23. Wu, H. (2001), “Reinventing Exhibition Space in China” in Chinese Art at the Crossroads: Between Past and Future. Between East and West. Hong Kong: New Art Media Limited. Pp168. Zendai MoMA. (2005),http://www.himalayasart.cn/ ( Accessed 07/03/10).